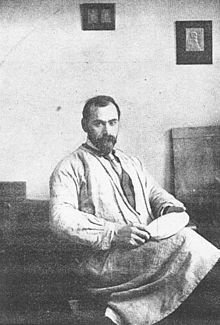 Victor David Brenner (born Avigdor David Brenner; June 12, 1871 – April 5, 1924) was a Litvak-American sculptor, engraver, and medalist known primarily as the designer of the United States Lincoln Cent. Brenner was born to Jewish parents in Šiauliai, Lithuania. His name at birth was Avigdor David Brenner ("Avigdor ben Gershon," in Hebrew, as his gravestone attests), but he changed the name to Victor David Brenner. He emigrated to the United States in 1890, living mostly in the New York City area. When Brenner arrived in America, he had little more to fall back upon except the trade taught him by his father — gem and seal engraving. This technical preparation included the tools of the sculptor's craft. He took night classes at Cooper Union. Brenner soon mastered English as he had mastered French. Eight years later Brenner was in Paris, studying with the great French medalist, Oscar Roty at the Académie Julian. There he exhibited his work and obtained awards at the Paris Exposition of 1900. He returned to the United States, and from that time on his career prospered. He appeared to be on his way to the fulfillment of the splendid predictions made for his future by Rodin. Brenner is probably best known for his enduring Lincoln coin design, the obverse of which is the longest-running design in United States Mint history. Brenner's design had been picked by 26th U.S. President, Theodore Roosevelt, who had earlier posed for him in New York. Since arriving nineteen years earlier in the United States, Brenner had become one of the nation's premier medalists. Roosevelt had learned of Brenner's talents in a settlement house on New York City's Lower East Side and was immediately impressed with a bas-relief that Brenner had made of Lincoln, based on the early Civil War era photographer, Mathew Brady's photograph. Roosevelt, who considered Lincoln the savior of the Union, the greatest Republican President and also considered himself Lincoln's political heir, ordered the new Lincoln penny to be based on Brenner's work and that it be produced to commemorate Lincoln's 100th birthday in 1909. The likeness of President Lincoln on the obverse of the coin is an adaptation of a plaque Brenner executed several years earlier and which had come to the attention of President Roosevelt in New York. Bronze bas-reliefs dated 1907 and signed by Brenner have been identified and some sold in auctions for as much as $3,900. Charles Eliot Norton of Harvard, whom Brenner counted among his friends, gave the sculptor an unpublished portrait of Lincoln which served Brenner as a basis for Lincoln's features. He also examined other portraits. When Brenner forwarded the model of the Lincoln cent to the Director of the Mint, the design bore his whole name, after the fashion of the signatures on the coinage of other countries, notably on the gold coins which Oscar Roty designed for France. The Director, however, decided to have the initials substituted for the name. Following the precedent of James B. Longacre, whose initials "JBL" (or simply "L") graced a number of U.S. coin designs for much of the latter half of the 19th century, Brenner placed his initials "VDB" at the bottom of the reverse between the wheat ear stalks. 1909 VDB penny on Mars, covered in Martian dust despite its vertical mounting position. 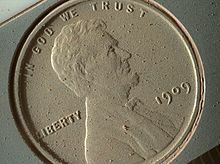 A 1909 VDB US cent was mounted on the calibration target on the Mars Curiosity Rover. This is a nod to the rover's geologic mission and the common practice by geologists including a coin in photographs to document the size of objects. ^ Baranauskas, Edward W. (March 15, 2000). "Profiles: Brenner of Baranauskas? : Unraveling the Mystery of the Name and Origin of the Designer of the Lincoln Penny". ^ "Victor David Brenner". FindaGrave.com. ^ DAVID MARGOLICK (February 11, 2007). "Penny Foolish". New York Times. Retrieved 2008-08-08. ^ "Victor David Brenner". Fine Art September 2008, May 2007. Rago Arts and Auction Center. Archived from the original on 2011-07-15. Retrieved 2009-07-26. ^ a b c d e f g h Gardner C. Teall, “The Lincoln Cent and its Maker,” Harper's Weekly, 1909, p. 24. Wikimedia Commons has media related to Victor David Brenner. This page was last edited on 23 April 2019, at 11:47 (UTC).